Martz Faculty Page (less up to date) at the Department of Microbiology Website. Since 1997, I have been developing innovative, widely-used, award-winning tools for visualization of macromolecular structures in education, research, and structural bioinformatics. These are all free and open source. I have been coauthor on more than a dozen peer-reviewed journal publications in structural bioinformatics. I retired from teaching immunology in January, 2004. I did research in cell biology and immunology 1965-1997, publishing 46 research reports and 19 reviews. FirstGlance in Jmol (firstglance.jmol.org): A simple tool for exploring structures of proteins and protein-ligand or protein-drug interactions that works on all popular platforms and browsers. Adopted by Nature (try the buttons in reports of macromolecular structures) and other bioinformatics resources. First offered in 2005. 400 uses/day (January through April, 2016). More than 1,000,000 uses since 2006. Evolutionary conservation in the ligand-binding domain of a lymphocyte adhesion molecule revealed by the ConSurf Server with FirstGlance in Jmol. The domain above is from the leukocyte integrin LFA-1 (CD11a/CD18) discovered in 1981 by Springer, Martz, et al.. This structure was solved by Qu & Leahy in 1995, PDB code 1lfa. Top Five Molecular Visualization Resources for the Rest Of Us (top5.molviz.org): Tutorials, Exploration Tools, & Communication Tools that work on Windows and Mac OS X without installing anything (except Java in some cases), and will remain available for years to come. High School Teachers' Molecular Visualization Resources (highschool.molviz.org): Designed for high school teachers, working on Windows and Mac OS X, nothing to install. 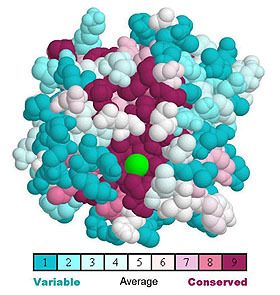 Our illustrated Atlas of Macromolecules (atlas.molviz.org) provides a handy source of examples to educators and students. First available in 2002. Updated 2016. Short Courses in Practical Macromolecular Visualization and Structural Bioinformatics (workshops.molviz.org) can be arranged, and have been hosted in Israel, Spain, and Japan as well as in the USA. 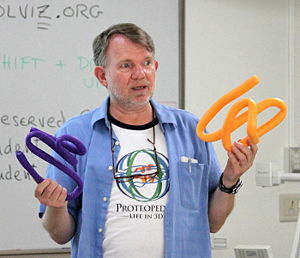 PDB Lite (formerly pdblite.org), by Eric Martz and Jaime Prilusky. Formerly mirrored worldwide, a simple search interface that helped beginners find published protein structures. First available 1998. Decommissioned 2010. The Molecular Visualization Freeware EMail Discussion provided an international forum for educators and developers. Founded 1995. Fell into disuse by 2010, superceded by the Jmol Users List. RasMol Classic Site provided the most complete documentation available for RasMol 2.6, a popular macromolecular visualization tool by Roger A. Sayle. Website developed 1995-2000. Subsequent RasMol development: rasmol.org. Martz Publications in Cell Biology and Immunology. Microbiology 597V: Macromolecular Visualization Lab: 2002, 2000, 1999. First taught 1998. Microbiology 320: Infectious Disease and Defense. Taught 1999-2003. Microbiology 540: Immunology. Taught 1981-2003. Microbiology 542: Immunology Laboratory. Taught 1981-2003. Microbiology 797J: Immunology Journal Club. Co-taught from mid-1980's through 2002.